The late Paul Bennewitz was a UFO researcher who was set up and discredited by a disinformation campaign in which Richard Doty allegedly played a crucial part. Bennewitz had witnessed and filmed several UFOs which he had sighted on the ground and in the air near Kirtland AFB and the Manzano range (New Mexico). He managed to establish communication with the occupants of the UFOs. Afraid they might be building a secret base that would be unknown to the USG, he contacted security people at Kirtland to inform them. The result was a carefully orchestrated campaign, designed to discredit and mentally ruin him. It is believed this campaign was orchestrated by the AFOSI's Rick Doty and Steve Atwater, who provided Bill Moore with disinformation, who then in turn passed this disinformation on to Bennewitz. He died on 23 June 2003. In 1979, Paul Bennewitz operated a small electronics company, called Thunder Scientific Corporation, in Albuquerque, New Mexico; he was a brilliant physicist and inventor. 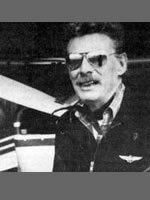 He also had an avid interest in UFOs, and was an investigator for APRO (Aerial Phenomenon Research Organization), the Arizona UFO group founded by Jim and Coral Lorenzen. From his home on the outskirts of Albuquerque, Bennewitz had, along with others, seen strange lights in the night sky over the Manzano Test Range outside Albuquerque. The lights seemed to appear almost every evening and to fly towards Coyote Canyon, also a part of the Kirtland Air Force Base area that included Sandia National Laboratory and Phillips Laboratory, both of which conduct ultra-top-secret government research. In early 1980, Paul Bennewitz became involved in observing and filming objects which he had sighted on the ground and in the air near Kirtland Air Force Base and the Manzano range; reportedly, his wife Cindy was also present to witness some of the first landings he witnessed and filmed in the Coyote Canyon area. Subsequently, on 24 October 1980 he contacted Major Ernest Edwards of the Kirtland Security Police who, over the period of the next few months, became concerned and requested the guards on the Manzano Weapons Storage Area to report to him any sightings of unusual aerial lights. At the beginning of August 1980, three guards reported sighting an aerial light which descended on the Sandia Military Reservation. Ernest Edwards reported the sighting to AFOSI Special Agent Richard Doty, unaware that Doty had already heard from Russ Curtis (the Sandia Security Chief) that a Sandia Security guard had sighted a disc-shaped object near a structure just minutes after the sighting by the three Manzano guards. Doty included these reports and several others in his formal report, forwarding it to AFOSI (Air Force Office of Special Investigations) Headquarters in Washington DC. From this point on, many other persons became involved. Bennewitz was called to a meeting at Kirtland AFB at which several major Air Force officers and Sandia personnel were present, including a Brigadier General. Ernest Edwards has confirmed that the three guards under his command reported what was described, and that the meeting did take place. Richard Doty and Jerry Miller, Scientific Advisor for Air Force Test and Evaluation Center, Kirtland AFB, interviewed Bennewitz in his home on the edge of Manzano Base. They examined Bennewitz's films and tapes, and Miller, a former Project Bluebook investigator at Wright-Patterson AFB, determined that the films did show some type of unidentified aerial objects. They also noted the array of electronic surveillance equipment that Bennewitz had pointed at Manzano. AFOSI declined to investigate further, but scheduled an inspection of Bennewitz's data by personnel at Wright-Patterson. AFOSI also did a background check on Bennewitz. There is a document signed by Thomas A.Cseh, Commander of the Base Investigative Detachment, to confirm this. Finally there is the complete set of documents which were released by AFOSI Headquarters under cover of the Department of the Air Force, relating to the described events. Meanwhile, in 1979 or 1980 (the record of the year is unclear), Bennewitz and Dr. Leo Sprinkle, a psychologist and respected UFO researcher, had been investigating the story which a deeply troubled woman named Myrna Hansen told them. She claimed that she and her young son had seen a UFO while driving on a rural road near Cimarron, in northeastern New Mexico. With the patient's permission, Dr. Sprinkle began hypnotizing her, and over a three month period, Bennewitz and Sprinkle heard a very unusual story. Under hypnosis, Hansen said that not only had she seen several UFOs that day, but she had seen cattle being abducted – and she and her son had also been abducted by the aliens and taken to a secret underground base where they saw the cattle being mutilated and drained of their blood, and saw vats containing human body parts. She further said that some sort of implants were placed in the bodies of her and her son and that the aliens could control their minds through these devices. Bennewitz believed the woman's story, and he believed that it was connected somehow to the lights he was seeing over Manzano. He began filming the lights, amassing over 2600 feet of film. He also came to believe that he could receive signals from the craft that he observed. He built antennae and receivers to receive low-frequency electromagnetic transmissions that he believed came from the alien craft. Bennewitz called his "mission" Project Beta. Those who have seen the films and heard the tapes of the low-frequency radio transmissions insist that there is no doubt that Bennewitz was filming and recording real phenomena. Taking a step that ultimately led to his later troubles, Bennewitz wrote a computer program that he claimed could translate the alien radio transmissions. He now came to believe that he was intercepting the messages that the aliens were transmitting to mind-control devices such as those that Myrna Hansen claimed had been placed in her and her son. On 10 November 1980, Bennewitz presented his evidence again, this time to high ranking Air Force personnel including Brigadier General William Brooksher. In the report of this meeting, it is noted that Bennewitz was advised to apply for an Air Force grant to study the phenomena. Once again, however, the AFOSI declined to investigate the matter themselves. Bennewitz was not to give up so easily. Besides the regular reports he was sending to APRO, he was contacting US Senator Harrison Schmidt and Senator Peter Domenici, as well as other UFO investigators such as Linda Moulton Howe and John Lear. By 1982, APRO had decided to investigate Bennewitz's claims. They sent William Moore, one of their directors and a former schoolteacher turned writer and ufologist, to talk to Bennewitz. Moore had gained a degree of fame in the UFO field by co-authoring (with Charles Berlitz) The Philadelphia Experiment and The Roswell Incident. The already complex story gained an additional twist in that Bill Moore later stated in a public confession that he was recruited by someone with the code name Falcon to lead Paul Bennewitz astray by giving him false information. He claimed that he was given his orders by an AFOSI Agent, and that for four years, he was asked to feed disinformation, including the forged "Aquarius Document" to Bennewitz. This disinformation included "verification" of Bennewitz's beliefs about the "grays" and the underground base at Dulce. Paul Bennewitz gradually became more and more paranoid, claiming that aliens came through the walls of his house at night and injected him with chemicals. He began keeping guns and knives all over his house. Finally, he had to be hospitalized for "exhaustion", and subsequently died on June 23, 2003.